Did you realize that the exact center of our galactic system is in this sign? As we look more closely at the meaning behind this amazing two-natured creature, you will find a fascinating correlation to how our own lives center around this incredible truth. In Greek mythology, this was Chiron, the two-natured son of Saturn. He wa s renowned for his knowledge of medicine, music, and marksmanship. He, according to this myth, was a teacher of mankind in the arts of medicine — yet he died from a scratch from a poisoned arrow. This is, in fact, a picture of a two-natured person — but not Chiron — Jesus Christ! He was the Son of God and the son of man — undiminished diety coupled with perfect humanity. And He was the Great Physician — and the Master Teacher! 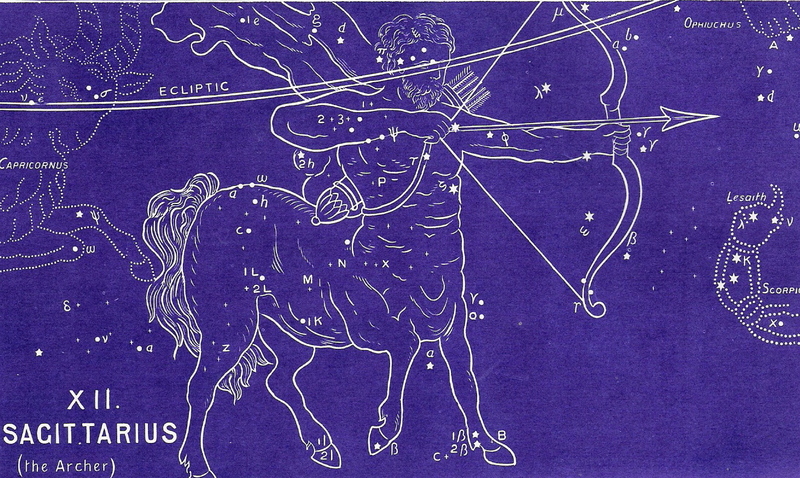 With Sagittarius, we begin the chapter of seeing the completion, or fulfillment, of the great Promise of a Suffering Savior. Here is a picture of a two-natured archer who is aiming his arrow directly at the heart of the Scorpion, assuring its doom. Remember that Scorpion represents the great enemy, Satan. (See Scorpio for more information). Notice also that the two-natured beast lifts his forefoot as if it has been wounded. Again, a pictoral representation of Genesis 3:15 — where the Seed of the woman (Jesus) is prophesied to crush the head of the serpent (Satan) and be bruised on the heel in the process. This is another vivid reminder of Christ’s suffering on our behalf — His death for our life. The Gospel story in the stars began with a promise of a Savior who would redeem mankind from the penalty of their sin. This promise was made sure by providing a sacrifice. This plan became the object of the concerted attacks of the forces of evil. But the plans of God do not suffer from the will of man nor Satan. The sacrifice would be made, and in so doing, the utter destruction of the strongholds of evil was made certain. Jesus Christ came to die. 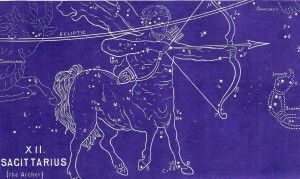 He “set his face toward Jerusalem, knowing that there he would offer himself for the sins of the world.” In Sagittarius we see the beginning of the fulfillment of that original plan, with the coming of a two-natured Savior. To continue in the correct order of the ancient star chart, please select the Lyra menu option.